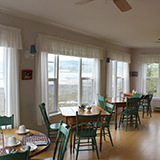 Our rooms are friendly and inviting with spectacular ocean views and antique furnishings. Looking for the ideal “get away”, honeymoon or romantic weekend? Compass Rose Heritage Inn is your place to relax, slow the pace down, and just enjoy the natural wonders around you. Located in North Head, just minutes from the ferry, our guest rooms look out over the harbour and bay and have lovely ocean views. Five guest rooms and one suite, which includes a fully equipped kitchen. All rooms have a private bathroom and include an extensive continental breakfast buffet served in our ocean front dining room. Year Round. Front desk service. Restaurant on site. Breakfast included. 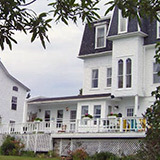 The Inn at Whale Cove Cottages is located at 120 Whistle Road in the village of North Head. We have 3 Inn rooms each with private bath and private entrance. Each room has one queen bed and the daily rate includes a full breakfast. The property is secluded and all the accommodation have water views. Trail and beach access. Video and pictures at the website linked below. The Marathon Inn is everything you would expect of a hotel originally built over a century ago by a retired sea captain. The Inn has been well maintained over the years and has recently been refurbished. It still retains the charm and leisurely living of another age. Antiques and period decor complement the mood. You will be welcomed and served with gracious hospitality during your stay. The rooms are sun-clean and inviting with private bath. Many of them overlook the harbour. An “Island” tradition for over 40 years, the Surfside Motel is situated on 5 acres with beach access overlooking Flagg’s Cove and Long Island Bay. 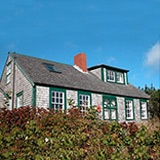 21 Motel Units and 3 Housekeeping Cottages are available year-round. 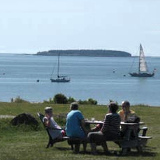 Stay for a night or come for a couple of weeks and sit back - enjoy the view - while you barbeque your next feast!